But philosophy is not science. Our wonder over Man becomes philosophy, when it reaches the question of Man as such. Philosophy throws out answers to the question, argues for the answers and investigates their consequences. This happens first of all by reflecting and meditating over the things, not by experience-scientifical way. There is a difference between traditional philosophy and philosophy as an art of life, though. 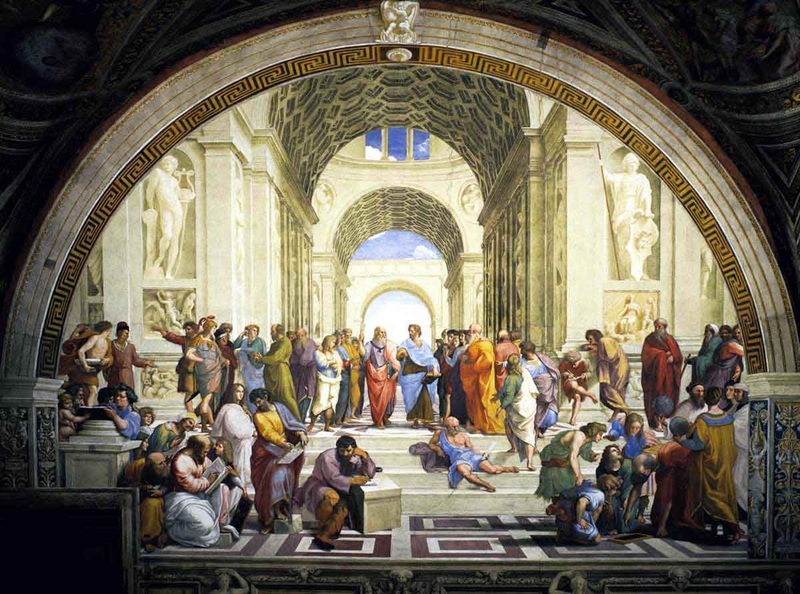 The most important difference between traditional philosophy and philosophy as an art of life, is, that where the philosopher in traditional philosophy constructs philosophies, then the philosophical practice in philosophy as an art of life, has as intention to change the philosopher, to bring him in harmony with life itself, and give him insight in life. In traditional philosophy they only work with two forms of cognition: sensation and reason. Truth and reality are something you theorize and argue about, and to philosophize is an intellectual training, namely thinking. In philosophy as an art of life you also work with a third cognition-form, namely revelation or being-cognition; that is to say: the direct discovery and experience of truth or reality. To philosophize consists here in an existential training of the mind and the heart, namely meditation. To philosophize is therefore in art of life more existential experimenting than logical analyzing, more seeing than thinking, more listening than arguing. Here philosophy is understood as a way of life, where you strive after wisdom and happiness; that is to say: where you practise a certain realized and clarified way of life. In this it differs from the academical philosophy, where the work with philosophy is a purely theoretical activity, included the so-called practical philosophy. Traditions where the concept of philosophy slides in one with a certain existential form of training and therapy, is both found in the East and in the West. From the East can be mentioned Indian and Buddhist philosophy, Taoism and Zen Buddhism. From the West can be mentioned Greek and Roman philosophy, and the whole tradition of mysticism within Christianity, Judaism and Islam. Philosophy as an art of life claims that our problems are due to a separation of the observer and the observed. In its practice it directs itself away from the observed, towards the observer himself. And its questions become of existential, conceptual, ethical, epistemological and metaphysical kind. Psychotherapy is a branch of psychology, and therefore something scientifical, which directs itself towards aspects of the observed, that can be empirical tested. Therefore it must not contain philosophical and/or religious theories. But this is precisely what for example New Age psychotherapies do, and in neglecting the observer, they are misguiding their clients philosophical and spiritual. A reaction to this is seen in the new movement of philosophical counseling (see my articles The devastating New Age turn within psychotherapy and Philosophical counseling as an alternative to psychotherapy). The cause of suffering is in philosophy as an art of life due to a separation of the observer and the observed. The investigation is directed towards the observer (the form of consciousness: the one who evaluates, who says yes and no, who accepts and denies, who compares with earlier and hopes/fears something else), and not the observed (the contents of consciousness: feelings, thoughts, experiences, sense impressions, memories, wishes, hopes, fears, lusts) as in psychotherapy. The main question is therefore in its essence philosophical: Who am I? And in connection with this main question come a series of other philosophical questions. In my book Meditation as an Art of Life – a basic reader, I show that all the masters within the wisdomtraditions actually used philosophical questions as their central meditation technique, and that all other spiritual exercises only were used to support this. In this way philosophical questions were a kind of universal koans, which worked with the purpose of opening the consciousness in towards the Source: the Good, the True and the Beautiful. In this way philosophy as an art of life therefore more reminds about a religious way of life. They both have focus on convictions and ideas, and see these as a condition for feelings, not as a result of feelings. They are both engaged in the moral and ethical aspects of the convictions, and especially in the understanding of the meaning of life. Moreover they both involve the spiritual area. What is then the difference between philosophy as an art of life and a religious way of life? Unlike the established religions then these philosophical therapies presuppose no religious doctrine, ideology, myth or conception (or psychological theory/management theory). They put their emphasis on realization and inner transformation. And the masters within these philosophical therapies are precisely living a philosophical way of life, rather than a traditional religious way of life. And their way of teaching is based on philosophical counseling. That means, that the silent assumptions, things that are taken for granted, and premises within the religions, themselves are facing examination in a philosophical way of life. Is there coherence in it? It is self-contradictory? What about one´s way of being, is it self-circling or self-forgetful? And what about the autonomy and the power of action? Are you yourself or dependent on others, etc. The answers in philosophy as an art of life are not conclusions to anything (as they are within the established religions), but only tools for the philosopher´s own self-inquiry. As the philosopher Ludwig Wittgenstein says in his Tractatus, then the words only are a ladder, which you can use to rise up above them with. Afterwards you throw it away. In the same way they say in Zen, that the words only are a finger pointing at the moon. You must never confuse the finger with the moon. That, whereof you cannot speak, about that you must be silent. And then you have stepped into the wordless silence. But you can use religions as a frame of reference in this quest (see my article The value of having a religion in a spiritual practice).